A fire incident can be chaotic, confusing and complex. Most certainly it is dynamic, with change ever occurring, sometimes at a rapid and unexpected pace. The successful leader is able to make sense of the chaos and develop a credible plan. He or she is then able to communicate that plan, win support from others and thus the ability to implement. Leadership is influencing people-by providing purpose, direction and motivation-while operating to accomplish the mission and improve the organization. 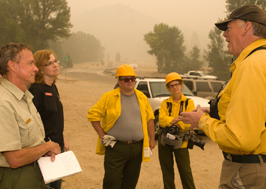 One of the key factors in directing and communicating any plan is to conduct a Briefing. Briefings are required when a change in the incident environment, assignment or personnel occurs. The beginning of an operational shift, a change in tactics or procedures, or orientation for a newly-assigned resource-these are a few examples of when a briefing would be necessary. At the heart of every briefing is Leader's Intent, or what the goal is. In this portion of the Leadership Toolbox you will find some useful information and techniques to help you become a better communicator. "Affect Them with Intent" expounds on the role and purpose of Leader's Intent. There is a link to an article by U.S. Army Lieutenant Colonel Lawrence Shattuck on intent and command presence. "What a Good Briefing Will Cover" details the briefing checklist found on the back of the Incident Response Pocket Guide. "Tips for the Timid and the Bold" offers some helpful suggestions on improving your briefing skill. Finally, the "Ten Commandments of Good Listening" offers some principles to improve listening skills. "In studying the examples of the orders issued to our troops in France, several important points deserve consideration in determining the relative excellence of the orders issued. It is frequently the case that what appears to have been a model order was actually the reverse, and a poorly and apparently hastily prepared order will often be erroneously condemned. Many orders, models in their form, failed to reach the troops in time to affect their actions, and many apparently crude and fragmentary instructions did reach front-line commanders in time to enable the purpose of higher command to be carried out on the battlefield. It is apparent that unless an order is issued in time for its instructions to percolate down throughout the organization sufficiently in advance of an engagement to enable each commander to arrange his unit accordingly, that order is a failure, however perfect it may appear on paper. Our troops suffered much from the delays involved in preparing long and complicated orders due to the failure of the staff...to recognize that speed was more important than technique." So that started the evolution and by 1940, we had the 5 Paragraph Field Order format - it was tweaked during WW2 and today it is remarkably similar now to what it was then. In fact - one of the case studies today for the near perfect order was VII Corps operations order to attack near Remagen in March 1945. The IRPG (Incident Response Pocket Guide, PMS 461) briefing format came directly from the military mission briefing format, which follows the "5 Paragraph Field Order." Quality of operational briefing protocal was questioned in the follow up reports for the 1994 South Canyon fatalities. (IMRT in 1995 and TriData Phase III in 1998). TriData pages 3-70 to 3-86 deal with this...most specifically stated under Goal #20...Implementation strategy #1 = Improve the quality of briefing at incidents and Implementation strategy #2 = Develop and use checklists for transmission of information. The following year, in 1999, the first IRPG was issued and there was a briefing checklist on the back cover, though significantly different than what is there now. In 2001 incident briefing again becomes a focus following the 30 Mile fatalities in 2000. 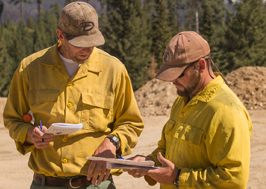 The Accident Prevention Plan established briefing requirements for fireline supervisors and incident commanders. In 2001 and 2002 the leadership development effort began to gain traction with NWCG. 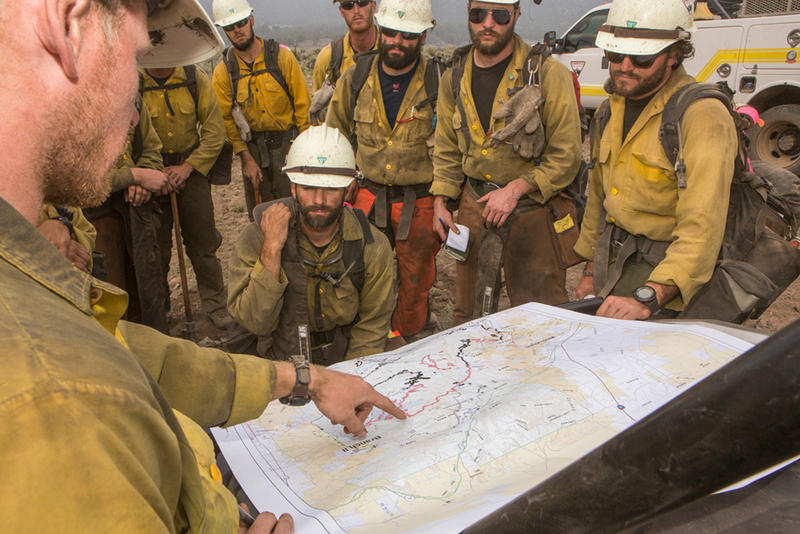 The Fireline Leadership course (later L380) was getting stood up within the Interagency Hotshot Crew and Smokejumper world and the Leadership Committee was chartered and quickly established a working relationship with the Marine Corp University. 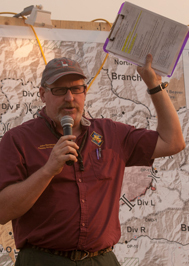 When the IRPG was next revised in 2002, the wildland fire service had a briefing format that looked a lot like the marine's SMEAC or the army's SMESC. The information briefing is used to inform the listener. This briefing deals primarily with facts, not conclusions or recommendations. Use it to present high priority information requiring immediate attention; complex information involving complicated plans, systems, statistics or charts; and controversial information requiring elaboration and explanation. The following format works well for an information briefing. Greeting. Use courtesy, address the person(s) receiving the briefing and identify yourself. Purpose. Explain the purpose and scope. Procedure. Indicate procedure if briefing involves demonstration, display or tour. Prepare to answer questions at any time. Arrange main ideas in logical sequence. Announce the next briefer, if applicable. 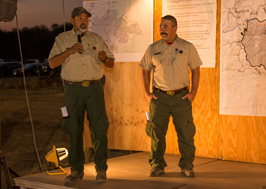 Use the mission briefing under operational conditions to impart information, to give specific instructions or to instill an appreciation of the mission. In an operational situation or when the mission is of a critical nature, it may become necessary to provide individuals or smaller units with more data than incident action plans or general orders provide. You may do this by means of the mission briefing. The mission briefing reinforces orders, provides more detailed requirements and instructions for individuals, and provides an explanation of the significance of their individual role. You must present this type of briefing with care to ensure that it does not cause confusion of conflict with plans and orders. One person usually conducts the mission briefing. This person may be the Incident Commander, Operations Section Chief, Division Group Supervisor, Module Leader or a special representative, depending on the nature of the mission or the level of the incident. There is no prescribed format for the mission briefing. It should possess the Briefing ABCs (below): accuracy, brevity, and clarity. In some cases you may use the briefing checklist provided in the IRPG (SMECS) if it doesn't result in unnecessary repetition. A decision briefing is intended to obtain an answer or a decision. Personnel use this briefing for most strategic and/or tactical matters requiring command decisions from higher authority. Purpose. State that the purpose of the briefing is to obtain a decision and announce the problem statement. Procedure. Explain any special procedures such as a trip to outlying facilities or introduction of an additional briefer. Coordination. Indicate accomplishment of any coordination. Classification. State the classification of the briefing. Assumptions. Must be valid, relevant and necessary. Facts bearing on the problem. Must be supportable, relevant and necessary. Discussion. Analyze courses of action. Plan for smooth transition. Conclusions. Degree of acceptance or the order of merit of each course of action. Recommendation(s). State action(s) recommended. Must be specific, not a solicitation of opinion. 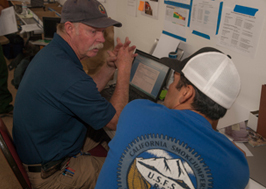 The staff briefing is to secure a coordinated or unified effort. This briefing may involve the exchange of information, the announcement of decisions, the issuance of directives or the presentation of guidance. The staff briefing may include the characteristics of the information, decision and mission briefings. Staff briefings are normally scheduled on a periodic basis. The attendees are usually the Incident Commander (IC), the Deputy IC, Command and General Staff. Sometimes subordinate staffs may attend. The Plans Section Chief usually presides over the staff briefing. This person opens the briefing by identifying the purpose of the briefing and reviewing the mission assigned; then restates the IMT's mission and gives the IC's concept, if applicable; then calls on command and general staff officers to brief their areas of responsibility. The IC usually concludes the briefing, and may even take an active part throughout the presentation. 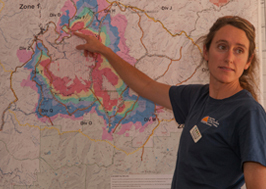 The tactical situation briefing is a form of staff briefing used to inform persons not familiar with the situation at the level at which the briefing is taking place. The briefing goes back in time as far as necessary to present the full picture. When the main intent of regularly scheduled staff briefings is to achieve coordinated effort within, the substance of each staff officer's presentation should only involve updating of material previously presented. Who is to be briefed and why? How much knowledge of the subject does the audience have? What is expected of the briefer? The basic purpose is to present the subject as directed and to ensure that it is understood by the audience. Brevity precludes a lengthy introduction or summary. Logic must be used in arriving at conclusions and recommendations. Interruptions and questions may occur at any point. If and when these interruptions occur, the briefer answers each question before proceeding or indicates that the questions will be answered later in the briefing. At the same time, the briefer does not permit questions to distract from the planned briefing. If the question will be answered later in the briefing, the briefer should make specific reference to the earlier question when introducing the material. The briefer must be prepared to support any part of the briefing. The briefer anticipates possible questions and is prepared to answer them. When the briefing is over, the briefer prepares any follow-up actions such as who is to take action, recommendations and their approval, disapproval, or approval with modifications. When a decision is involved and doubt exists about the decision maker's intent, the briefer provides the decision maker a draft of the decision for review before finalizing. Ask if you don't know. Some briefings lack enough information, other briefings provide too much information. Somewhere in between is what most of us are looking for: a useful briefing. How often should briefings be given? The answer is: as often as they are needed. An overall picture of the situation/incident so those being briefed have a general idea of what is going on. After the big picture, focus in on where and how those being briefed fit in. Using maps or terrain models scraped together on the ground will help provide a clearer perception of the situation. The portion of the briefing where chain of command is explained; Leader's Intent is delivered; specific assignments and tactics are given; and contingencies are proposed. Where the Communication Plan and Medical Plan are explained. The methods, channels and frequencies being utilized for receiving and passing information to other resources on the incident. How often personnel should check-in and provide updates. The critical times for information delivery such as weather updates and resource needs for the next shift. What to do in the event of an emergency, what protocols to follow in the event of an accident or injury. What other resources are on the incident, and how they might be accessed if needed. This portion would also include how to get supplies, equipment, or transportation. A discussion of what known and potential hazards may exist in the work environment, methods to communicate those hazards to others, and whether to AVOID, MITIGATE or ELIMINATE the hazard. This is also the portion of the briefing where LCES - Lookouts, Communication, Escape Route(s) and Safety Zone(s) - would be addressed, as well as any identified trigger points. Every briefing should be concluded with an opportunity for feedback from those who have been briefed. Questions about assignments can be asked and answered, concerns that the leader didn't realize or understand can be expressed, and perceptions can be brought more in line with reality. Remember your Standard Firefighting Orders includes: Give clear instructions and be sure they are understood. Consider the audience listening and tailor the message accordingly. Avoid the use of unnecessary jargon or slang. Speak clearly, and make eye contact with the listeners. Try to give the briefing in an environment that will not be interrupted by intrusive sounds. Pay attention to the feedback you receive from a briefing…does it reflect that you imparted accurate information? If not, why not? Use the inside back cover of the Incident Response Pocket Guide to guide your briefing. Practice giving briefings and have a supervisor or co-worker critique you. Ask your supervisor if you can have an opportunity to prepare and deliver actual briefings during appropriate situations. Listen to briefings of others using the Incident Response Pocket Guide back cover and ask for any information that is missing. Recognize that nervousness while speaking in front of a crowd is common. In one study, 77% of experienced speakers admitted to some stage fright on each speaking occasion. In another study, people had a greater fear of public speaking than death. Overcome your anxiety by being well-prepared with your message, use the Incident Response Pocket Guide back cover as an organizer and get comfortable delivering briefings by doing them often. Listening is a process involving the reception and interpretation of messages spoken by others. A common misconception about listening is that it is easy. In fact, the opposite is true. Studies have shown that good listeners show increases in their physical activity when they are listening to others. Since the effectiveness of communications depends so heavily on good listening, it is important to develop our listening skills. Stop talking. Obvious, but not easy. Put the speaker at ease. Create a permissive, supportive climate in which the speaker will feel free to express himself or herself. Show a desire to listen. Act interested and mean it. Remove distractions. External preoccupation is less likely if nothing external is present to preoccupy you. Empathize. Try to experience to some degree the feelings the speaker is experiencing. Be patient. Give the speaker time to finish; don't interrupt. Hold your temper. Don't let your emotions obstruct your thoughts. Go easy on argument and criticism. Suspend judgment. Ask questions. If things are still unclear when a speaker has finished, ask questions which serve to clarify the intended meanings. Stop talking. In case you missed the first commandment. If you know what the topic is ahead of time, learn something about it so you will not be an ignorant listener. Even some careful thinking will allow you to listen more accurately when the communication actually begins. Try to discover the intent of the source; why is he or she saying these things? Look for an organizational scheme of the message. If the speaker is an accomplished one, you won't have to look very hard; it will be obvious. But if the speaker is less skilled, the responsibility falls to you. Do not accept what you hear at face value; analyze what the speaker is saying and pay attention to body language. Keep the main topic of the message in mind at all times, using it to bring focus to the information which the speaker supplies. This may be the most important. Listening takes work, and to do that you may have to "psych yourself up." At the heart of every briefing conducted for a group or individual is the purpose or objectives of the assignment. This is called "Leader's Intent." Leaders must communicate the purpose of a chosen action or direction so those being briefed have a clear understanding of the desired end state of an assignment. Clear and concise, the leader's intent includes a mission's overall purpose and expected results. With clearly communicated purpose and direction, followers can understand what they must do and why. Task: What it is to be done, or the "objectives"
Purpose: Why it is to be done, or "sense-making"
The end state is the leader's vision; or how the leader would like things to look when all is said and done. In a mission-oriented situation, the desired end state is how actions will be measured to evaluate success. When followers clearly understand the intent behind instructions, they are enabled to make better decisions on their own when conditions or the situation has changed. If followers know what the goal is, they will be able to determine what they must do to reach it, even if the leader is absent. A concept that goes hand-in-hand with Leader's Intent is Command Presence. Command Presence is transmitted by your ability to communicate effectively. Do not equate command presence with yelling out orders. Effective communication is two-way communication and involves a good feedback process. For more information, read Lt. Col. Lawrence G. Shattuck's article "Communicating Intent and Imparting Presence." This model, derived from the publication Leading in the Wildland Fire Service (PMS 494-2), illustrates that turning intent into action is both linear and cyclical process. 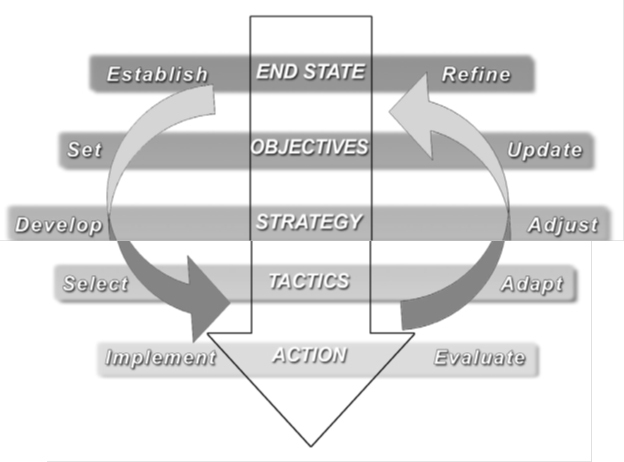 Initiating the linear process, the leader establishes an end state and sets objectives to accomplish it. Team members develop a strategy and make sure that the objectives can be accomplished given the available time and resources. Operational leaders then select the appropriate tactics and implement the action needed. The process is sequential, with each step requiring the completion of the previous step. The process becomes circular when leaders evaluate the results of the action and modify the plan at each level according to changes in the environment or the team. Read the article "Communicating Intent and Imparting Presence," by Lt. Col. Lawrence G. Shattuck describing the elements and importance of communicating intent to subordinates while imparting Command Presence. Discussion on Leaders Intent with Mark Smith, retired Senior Non-commissioned Officer, U.S. Army Special Operations and leadership development consultant with Mission-Centered Solutions. Cut this out and add it to your IRPG. The goal is not to replace the IRPG briefing checklist, rather to supplement with this template in order to create a more intuitive briefing. View the template (pdf). Mission briefing format on full size sheet of paper for constructing your briefing. View the worksheet (docx). Simple format for unexpected or changing conditions in order to provide quick and concise situational information. View the worksheet (docx).